To follow on from last week’s piece about trees and spreading your roots, here’s another psychology piece. 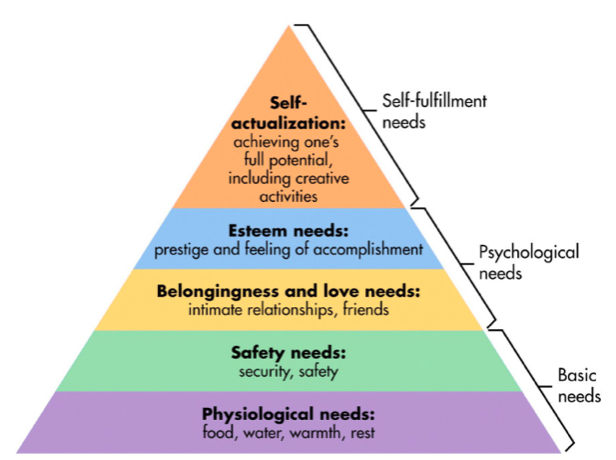 Abraham Maslow, was an American psychologist who, developed a theoretical framework in 1943 to help describe people’s needs and how lower level needs must be being met for higher level needs to come into the picture. Logically if you are struggling to have one of your basic needs met then the more in depth ones above it take a backseat - we’ve all been hungry and not been focused on our creativity. Or been tired and not given our friends the attention they deserve. So where does your gym and last week’s article about trees link to this? It should go without saying that your gym should be meeting your physiological and safety needs, so that you can then start focusing on the friendships formed there. Whilst it may be true that you can feel a sense of accomplishment without having friends around - the social setting of a gym full of like minded individuals definitely makes that feeling greater. Bear in mind that each moment could be hyper analysed to see which need is being met or not met at that moment in time, but that level of self-analysis may be a path you don’t want to go down. We will continue to do our utmost to meet your basic and psychological needs so that you may work as often as possible on your self-fulfilment needs. We also trust that you will strive to help meet other people’s psychological needs (by spreading your own roots) so that they too may work towards achieving their full potential. Are you helping people move up the pyramid with your words and actions?